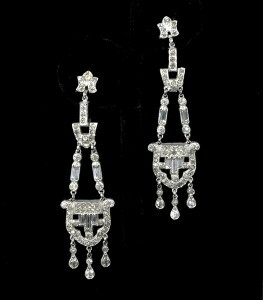 1920's vintage art deco drop earrings. Paste and rhodium plated base metal. Five part pavéd paste geometric open work drop. Top segments consist of rectangular and V shape links and baguette extensions. Pavéd baguettes & rounds shield shaped centerpiece with three tiny drops at each. Leaf motif button front at screw backs. Rhodium plated base metal setting. 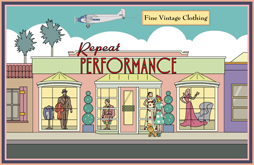 All original art deco era, true 1920's vintage. Very good condition. Shows moderate discoloration to paste.